Thanks to your donations, we can pay for NHS staff to attend advanced training events and conferences, helping their professional development and knowledge sharing, all of which will benefit the children they care for. These are extras above and beyond NHS core provision. We also fund several specialist staff posts in Grampian. You can read about them below. 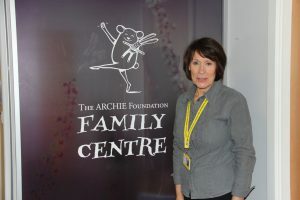 Lynn has been the Family Support Worker in The ARCHIE Foundation Family Centre since 2009. Lynn manages the centre, which has 19 rooms available to parents of children receiving treatment at RACH. The centre’s aim is to keep family close to their children while they are treated. This has been found to be hugely beneficial for children and parents. RACH covers a large geographical area, and many families live hours from the hospital – as far afield as Orkney and Shetland. Accommodation at The ARCHIE Foundation Family Centre is free of charge to parents and provided by donations to The ARCHIE Foundation. One night’s accommodation for a parent costs ARCHIE £17.50. As well as the rooms, which are ensuite, the centre has a kitchen and lounge where parents can make and eat their own meals and rest when they can. Lynn is at the heart of the service, not only ensuring the smooth running and administration of the centre, but also providing much-needed and appreciated support to families at a difficult and stressful time. Chantelle has been the ARCHIE Paediatric Pain Clinical Nurse Specialist since 2014. Without funding from The ARCHIE Foundation there would be no Pain Specialist at RACH. 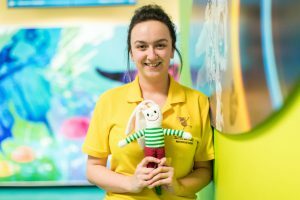 Chantelle works with young patients dealing with acute pain at RACH, carrying out 2-3 rounds on the ward every day, as well as the patient assessment unit, post-operative patients and those in the high dependency unit. Part of her role is also to train nursing staff in order to increase the number of nurses who have specialist skills in pain management at RACH, which of course has a clear benefit to patients and their families. Chantelle also provides support for patients suffering chronic pain at a fortnightly clinic and also supports palliative patients. This is a vital service that makes a really important difference to children and families at the most difficult of times. Chantelle provides The ARCHIE Foundation with an annual report on the impact of her work – the numbers of patients she has seen and the benefit it has provided them, their families and the clinical staff who work with them. Megan has been ARCHIE Play Leader at RACH since July 2017. She works on the surgical ward with children who are waiting for or recovering from surgery. Megan visits the children and their parents in the rooms and ward spaces to discuss any activities they are keen to take part in. Each child is given the opportunity to complete a ‘What Matters To Me’ sheet, allowing doctors, nurses, auxiliaries and play leaders to see their likes and dislikes and get to know them. Megan uses this information to organise and provide activities tailored to each child. Play is important to children at any times, and even more so during a hospital stay. As well as passing the time and aiding their recovery, keeping them moving and providing a sense of normality, play can also distract them from any pain or discomfort they might be experiencing. Play can be used as a technique to get children to do things to aid their recovery that they might not be keen to do – drinking fluids for instance can be made part of a game where they take turns. As well as helping and playing with children, Megan supports parents by allowing them the chance to take a break knowing their child is cared for. 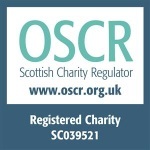 Grampian Child Bereavement Network (GCBN) is overseen by a board of 10 trustees and supported by 11 volunteers that supports children when they are bereaved. The network provides a responder service whereby trained volunteers work directly with children and their families, offering support and guidance. They can refer children to counselling, signpost local and national services and provide a central point of referral for children who have been bereaved. GCBN also provides information and support for parents, families, carers and professionals who are supporting a bereaved child or young person. Malcolm Stewart co-ordinates this service, and his post is the only paid post in the organisation, funded in part by The ARCHIE Foundation. 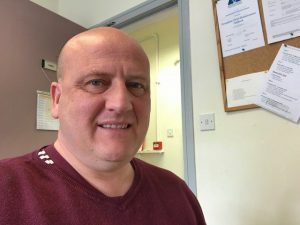 Malcolm also arranges activity days, these days vary from craft making and keeping memories safe to dry ski slope tubing. All done so the children can enjoy a day away but also share their experiences with other people who have similar experiences, if they want to. Malcolm’s role also includes the recruitment of volunteers for the charity. The network also provides training for schools, teachers and other professionals, providing advice on how they can support children when a teacher or fellow pupils dies. Malcolm and the volunteers work closely with the police, too. Chantelle is brilliant with the children. Helping them manage their pain makes such a difference when they are recovering from surgery. Thank you ARCHIE for everything you do.